Authors invest much time, money and talent in their books. 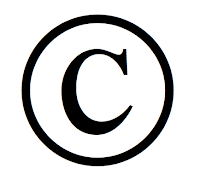 Please remember that a couple of pages of a copyrighted book/magazine article, manuscript, etc. can be copied for your personal research use. Any more than that, you need to obtain permission from the author. It's probably cheaper to purchase the book than to copy it. There is a copyright notice posted at OGS by the copy machines. Please be aware of the laws regarding copyright infringement. I'm sure we all want to stay on the right side of the law. 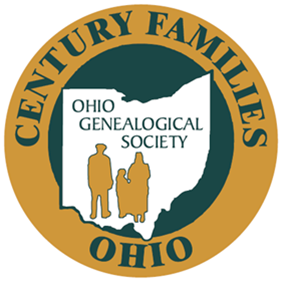 Today, at the Samuel D. Isaly library of the Ohio Genealogical Society, a workshop was held to help individuals that wanted to apply to a lineage society. OGS now has 5 different lineage societies, each unique in its own way. 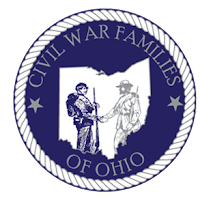 First Families of Ohio - you must prove an ancestor's residency before the end of 1820. 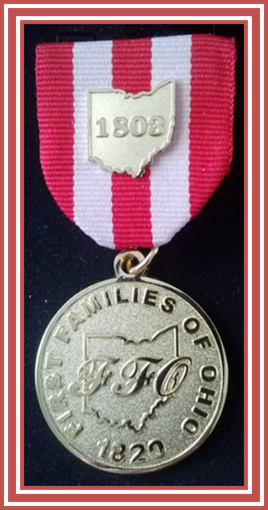 Additionally, if you can prove they were in Ohio prior to 1803 when Ohio became a state, there is an additional recognition. Settlers & Builders of Ohio - an ancestor's residency must be proven in the state of Ohio between 1821 and the end of 1860. Society of Civil War Families of Ohio - Any member of OGS who is a direct descendant, or a collateral relative, of any person with Ohio ties who served in the Civil War, for the Union or the Confederacy, is eligible to become a member of The Society of Civil War Families of Ohio (SCWFO). 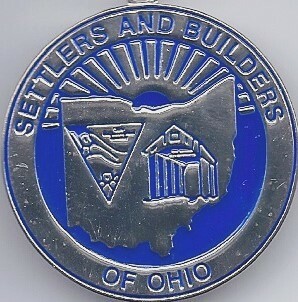 The person must have lived or died in Ohio or served in an Ohio unit. Service is not limited to an Ohio outfit. "Squirrel Hunters" and "Spies," male or female, are also eligible. 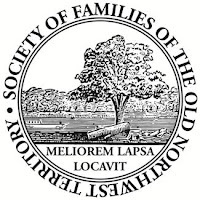 Society of Families of the Old Northwest Territory - Any member of OGS (or non-member) who is a direct descendant of any person who lived in what is now Indiana, Illinois, Wisconsin or eastern Minnesota (east of the Mississippi River) between 13 July 1787 and 7 May 1800 (when Indiana Territory was created) or your ancestor lived in what is now Ohio or Michigan between 13 July 1787 and 3 March 1803 (Ohio Statehood) or your ancestor lived in what is now Ohio, Michigan, Indiana, Illinois, Wisconsin or eastern Minnesota prior to 13 Jul 1787 as a citizen of either France or Great Britain, or as a Native American, you may qualify for this new Society. All OGS lineage forms are available here. All forms are in a PDF fill-in format and you can save them to your computer or device. Of course, there are a multitude of lineage societies out there. The first step is to decide which group you would like to join. The second step is to read the rules and guidelines for that particular society. 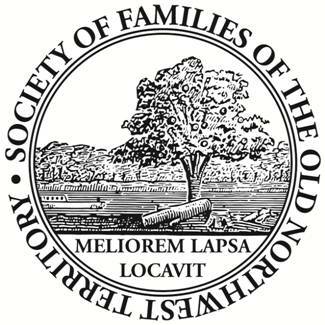 The OGS lineage societies require proper and legal documentation of one generation to the next. Proof of lineage must be submitted that confirms that lineage link. OGS does not allow biographical histories to prove lineage. However, biographical histories can be used to determine a date of residency. What is the first step after deciding which lineage society to join and reading their rules? As with all genealogy you will start with yourself and work backwards to the ancestors/ancestor you wish to honor. Once you have that Ascendant Chart filled out, start looking at the documentation you already have. Do you have birth records/certificates; death records/certificates; marriage records; wills and/or estates; land records; tax records; biographical articles; newspaper articles; cemetery listings; tombstone pictures; etc. for all the individuals you have listed? Do you have the documentation to prove dates and places? When your documentation is gathered and you are satisfied you have what you need, start putting your documentation in order according to the Ascendant Chart you filled out. By following the Ascendant Chart, your documentation should follow the same order. At this point you are only assembling the documentation. You do not want to number your documentation until the very last step. Multiple family lines can be proven on the same application. Multiple ancestors can be submitted on the same application. Females must be proven under their maiden names. All name changes for female ancestors must be documented. Once your documentation is in order, to your satisfaction, you will now compile your Documentation List and start numbering your document pages. Your name and contact information is to appear on each documentation page. Source citations are required. Please do not use staples, highlighters, or sticky notes/labels. Make sure you sign the application form. Scan all of your documentation in to one specific folder on your computer. They do not have to be scanned in any particular order. Open a Word document or some other text friendly program you may have. Create a header that includes the name of the lineage society you are applying to to the left. To the right, type DOCUMENT #______ and leave that line blank. In the footer, type your name and contact information. I suggest making the header and footer each about 1/2 inch as this will still allow plenty of room on the rest of the page. On the first page, type your name as you are the first individual on the Ascendant Chart. Insert a 'picture' of your birth certificate. Make the image so it is readable and a reasonable size. Under the 'picture' add your source citation. Continue in this manner until you have all individuals on your Ascendant Chart represented and all of the documentation needed to prove your lineage. By creating your application in a Word format, you are creating a base that you can use in the future if you should decide to join another lineage group. This format also presents a clean, crisp application. When you are preparing a lineage application, think of it as preparing a book to be seen by future genealogists and generations. You want that book to be the best you can assemble. Don't be afraid to insert small pictures of your ancestors. It adds more dimension to your application. If you are in doubt about any step in the process, please feel free to contact any of the lineage chairs. They will be more than happy to assist you with your questions and concerns. Good luck! We look forward to processing your application!